Should their IT operations remain on premise? Is a cloud-based solution more pragmatic? Thus far, regardless of being small or large accounting firms, On-premise networks are the preferred IT infrastructure. However the traditional on-premise network based functional features are all set to change, as the decade-old trend of cloud computing is slowly transforming office and workstation services via secure Application Service Providers (ASP) or as commonly called Cloud Services Providers. Cloud-based business service providers provide either pure SAAS service or services that include managed IT based on private cloud infrastructure secured on enterprise-class datacenters that are compliant with local and national Canadian privacy regulations. On-premise networks are secure and efficient, as accounting firms have been able to build networks running automated software, for localized multi-user access-points. Dedicated IT staff manage the complex end-to-end IT operations to keep the business running by providing services such as software/system/server/hardware purchases/maintenance, patches updates, SLAs, routine maintenance cycles, disaster recovery processes and more. Routine functioning of on-premise networks is subjective and as good as the expertise of IT staff. Alternative solutions which can overcome these limitations are Cloud Services. In United States, wide-ranging pubic cloud services by Amazon Web Services, Google Platform Live, Rackspace, MS Azure etc. are the technology platforms on which small and medium size businesses build their cloud IT operations but it’s not the preferred solution for accounting firms just like in Canada who opt more for private cloud based solutions. Accounting firms transforming to cloud-based accounting services find their interaction with clients has intrinsically multiplied in terms of value. The virtual platform maximizes reporting, improves insights and allows better integration with operational systems, thereby optimizing client’s profits. 1. Basic changes in technology strategy via cloud-based services allow accounting firms to provide in-depth, category-based review of a client’s business. 2. Value-addition services can include CFO services/outsourced accounting services in real-time. This improves one-to-one as well as one-to-many user/client interaction on the secured accounting firm portal improving client servicing scope. 3. Ensures instant access to reports or information via smartphones and gadgets in real-time. 4. For accounting firms, the delivery of high-quality add-on services allows room for ‘brand-building’ and newer avenues/opportunities. In May 2014, in a survey of over 100 firms by Association for Accounting Administration significant changes in the number of on-premise networks was observed. Only 71% maintained on-premise networks in 2014 as against the similar 2012 survey where 78% owned on-premise networks. Importantly, majority of the 5.2% drop in on-premise network owners had opted for vendor or third-party cloud providers. Though the advantages and benefits of virtual computing and IT-support are well-listed, questions remain on the wisdom of reworking existing IT infrastructure entirely to the cloud. What do you do when you already have an on-premise infrastructure? Should you yet move to the cloud? Answers to these questions are at two levels. Firstly, accounting firms will have to determine if organization is at a phase to leverage better benefits from the cloud entirely, partially or to remain on-premise. Secondly, firms will also have to evaluate if clients are acceptable on moving their private data to the cloud. However, both options offer unique benefits but ‘end- achievable’ will be subject to the native processes of the firms as well. Again, a key feature which compromise cloud-based working is the complexity of the platform. Multiple aspects of cloud computing sometime undermine the flexibility of operations in contrast to the agility achievable with on-premise installations. Additionally, data centers need to be located in Canada itself as data privacy laws are a primary concern for clients. Cloud service providers have come to recognize the slow-curve in moving entirely to the cloud. Therefore, their new solutions include on-premise options which work on the same set of management tools as those supporting their public, private or hybrid solutions. For example, Microsoft just launched its on-premise solution Cloud Platform Services running on Dell device, on the same Azure on-box services. Recognizing that the market continues to demand on-premise support for in-house operations for some of its sensitive processes, other vendors too are developing their versions of on-premise products. According to a recent survey by Tax Research was the most popular SaaS application used by 88% of the respondents. Significantly, 15% increase in the use of SaaS was observed in the latest survey over 2012 study. Nearly 59% respondents had opted for outsourced services of one of the above, with 11% more to opt for remailer services by the end of 2014. Cloud accounting is the best-fit technology solution for businesses. The significance of cloud computing remains the uniqueness with which it breaks down the traditional framework of working from offices and allows the novelty of remote-working. 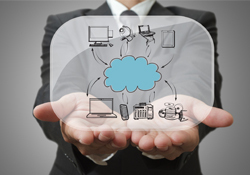 For clients too, cloud-based services are beneficial. It enhances user experience as they are no longer bound by time-zones and geographic locations and can access virtual accounting offices at their convenience. With mobile computing already on the horizon; on-premise servers and computing will soon lose its significance. It is necessary that your organization takes nano steps towards cloud-based accounting platforms as it brings value-addition to client services: financial reporting, insights and operational system integration ensuring clients running more profitable businesses.